For Research Associate : M.Sc. (Agri.) in Plant Pathology/ Plant Protection/ Entomology/ Botany with specialization in Plant Pathology. institutes with 1st Division or 60% marks. Age Limit : Maximum age limit is 35 years for Research Associate/ Computer Operator/ Senior Research Fellow & 40 years for Women. How to Apply : Interested applicants may additionally appear for Interview in prescribed utility shape along with one copies of bio-data, Original certificates, self attested photocopies of certificates & current passport length image at the time of Interview. For Young Professional-II : M.Tech/ M.Sec/M Phil in in Life Science/ Biotechnology/ Biochemistry/ Genetics/ Plant breeding/ Plant Molecular Biology/ Botany/ Plant Physiology or Equivalent degree. For Senior Research Fellow : M.Tech/ M.Sec in Molicular biology/Life Science/ Biotechnology or Post graduate. How to Apply : Interested candidates can also appear for Interview in prescribed utility shape along with 4 copies of bio-information, original certificates, self attested photocopies of every of the certificates & recent passport size photo at the time of interview. Venue of Interview : NRCPB, LBS Building, Pusa Campus, New Delhi-110012. National Research Centre on Plant Biotechnology (NRCPB) invites application for the post of Young Professional & Project Assistant. Walk-in-Interview 09 February 2017. For Young Professional-II - B.Tech/ MCA/ M.Tech/ M.Sec in computer science with first division or 60% marks in aggregate with knowledge of Oracle, java, ERP and Digital signature knowledge of MS Office Networking etc. For Project Assistant - B.Sc degree in Life Science/ Biotechnology/ Biochemistry/ Genetics/ Plant breeding/ Plant Molecular Biology/ Botany/ Plant Physiology or Equivalent degree. How to Apply - Interested candidates may appear for Interview along with four copies of bio-data, original certificate, self attested photocopies of each of the certificates & recent passport size photograph at the time of interview. Venue of Interview - NRCPB, LBS Building, Pusa Campus, New Delhi-110012. 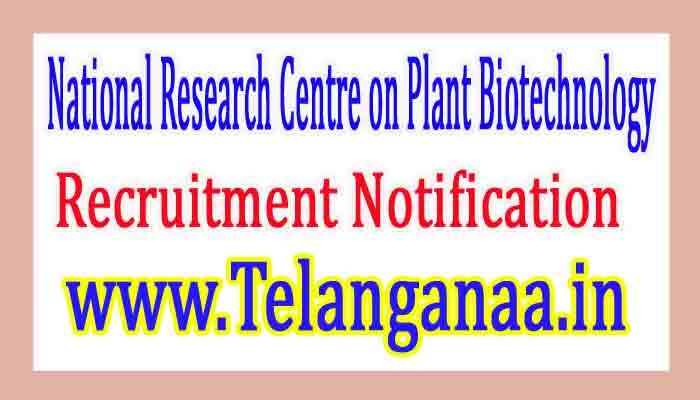 National Research Centre on Plant Biotechnology (NRCPB) invites application for the post of 04 Lower Division Clerk. Apply before 30 Days From the Date Of Publication. No. of Vacancy - 04 Posts. Educational Qualification - 12th Class or Equivalent Qualification from any recognized board . Application Fee - Candidates have to pay Rs.250/- with a Bank Draft drawn in favour of Project Director, NRCPB payable at New Delhi. SC /ST/ Women and Physically Handicapped candidates are exempted for Application fee. How to Apply - Interested candidates may apply in prescribed application form along with attested copies of relevant qualification send to the Project Director, NRCPB, LBS Building, Pusa Campus, New Delhi-110012 on or before 30 Days From the Date Of Publication.